Rooted phylogenetic networks are rooted acyclic digraphs that are used to represent complex evolution, where reticulation events (such as horizontal gene transfer, recombination, etc.) play a role. 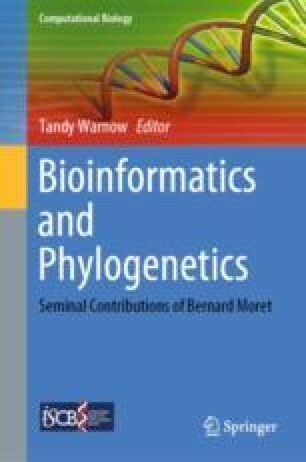 The combinatorial study of rooted phylogenetic networks has been an active research field of phylogenetics in the past decade. It serves as the foundation for the development of fast algorithms to reconstruct recombination networks in population genetics and hybridization networks in plant science. In this expository chapter, we introduce recent developments in characterizing the classes of rooted phylogenetic networks (including tree-based, reticulation-visible, galled networks, etc.) and designing fast algorithms for the cluster and tree containment problems for rooted phylogenetic networks. The author thanks his collaborators Philippe Gambette, Anthony Labarre and Stéphane Vialette (Université Paris-Est) for initiating a 2-year project on rooted phylogenetic networks, which was financially supported by the Institute of France at Singapore and the National University of Singapore. This chapter is mainly based on the findings from the project. The author thanks Andreas D. M. Gunawan, who injected many ideas for studying reticulation-visible networks. The author also thanks Daniel Huson and an anonymous reviewer for useful comments on the first draft of this work.